Manila, Philippines - MYX, the no. 1 local music channel named the winners of Music Awards 2014 on Wednesday, March 26 in a star-studded ceremony held at SM Aura Premier's Samsung Hall in Taguig City. Gloc 9 and collaborator Rico Blanco led the winners with four trophies, including top prize Favorite Music Video, for "Magda." Sarah Geronimo, meanwhile, won two awards, including Favorite Artist of the year. The MYX Magna Award, one of the biggest recognitions of the night, was given to Parokya ni Edgar, a band 20 years strong in the industry. 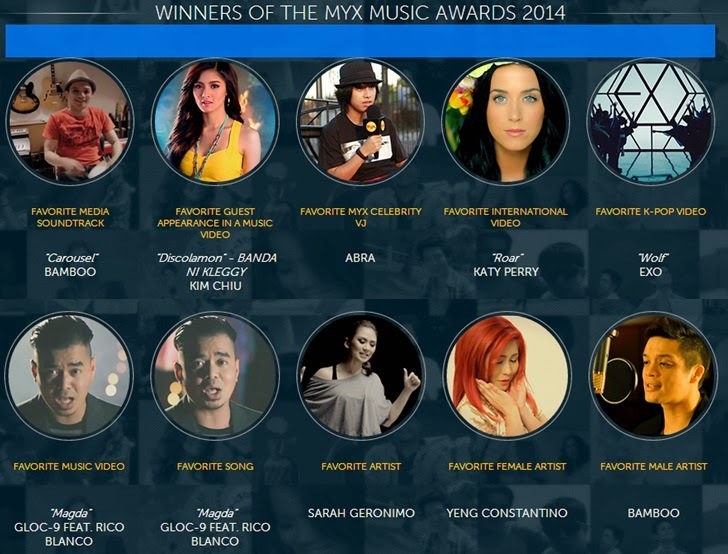 The 2014 MYX Music Awards also has a repeat telecast on March 28 at 7:30 p.m., March 29 at 2:30 p.m., March 30 at 10:30 a.m. and March 31 at 1 a.m.